We provide advance digital messaging and music solutions services for many industries around the world our goal is to produce a professional impression for any business. The iLink is a two-channel Internet downloadable messaging system utilizing MP3 compression to achieve near-CD quality audio playback. Units come with 2GB or 4GB of built-in flash memory to handle any audio application. The new backlit LCD screen and membrane touch keys control volume and mode settings as well as allowing local configuration of the unit’s IP. Also included is an internal monitor speaker for checking playback status. The iLink connects to the Internet through its built-in 10/100 LAN jack. All unit management and audio file downloads are performed by the authorized supporting dealer over the Internet using our secure i-Connect Studio software suite. The integrated two-way (push or pull) feature combined with the ability for changes to be initiated on demand or be scheduled from minutes to weeks in advance provide unlimited flexibility and convenience. The iLink provides a solid platform for all applications ranging from simple message-onhold with seamless single message playback to complex scheduled tasks requiring background music with fade and message mixing. 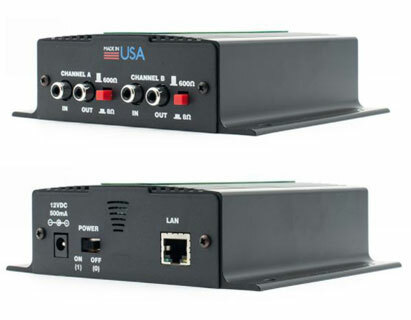 The dual independent outputs also make the iLink a “onebox-solution” in multi-zone installations. 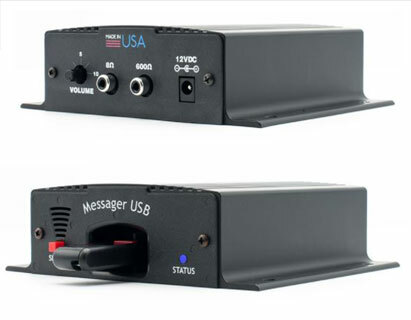 The Messager USB is a state-of-the-art digital audio playback device designed to provide a continuous play audio source for message-onhold, background music or any other audio application where high-quality audio playback is required. Messages are stored in MP3 or WAV format on any standard USB flash drive with no special software or drivers needed. The Messager USB is capable of high-quality audio file playback of up to 128Kbps MP3 files and 16-bit PCM 16 WAV. Audio content is easily managed by plugging the USB flash drive into a PC or MAC computer’s USB port and “dragging and dropping” MP3 or WAV file to and from the drive. Customers can receive new and updated message-on-hold or background music programs via e-mail or ftp and update the units themselves saving the added expense of additional USB flash drives and the related mailing and tracking costs. Along with optional message triggering, the Messager USB is also available with the next generation encryption software called Sonocrypt Level 3. This version of Sonocrypt encrypts the file itself making the MP3 or WAV file unplayable anywhere except on the Messager USB. This makes the distribution of your audio content safe and secure while eliminating unauthorized playback.